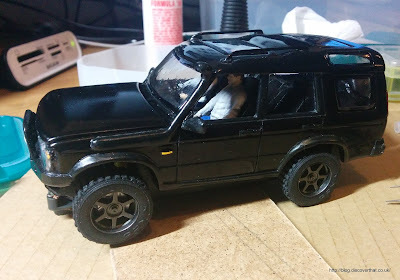 My 3D printed version of my Land Rover Discovery 2 is very nearly complete. 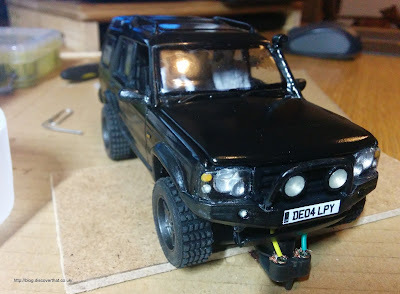 One or two drops of gloss varnish and 3 chassis screws and it is done. 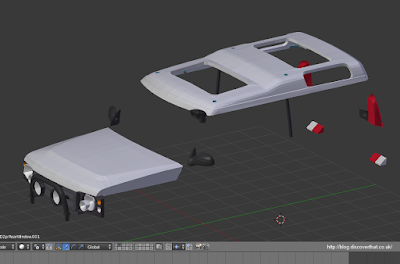 I'm now ready to share the 3D model file should anyone else want to try their own. The file format is for the free Blender 3D modelling application. 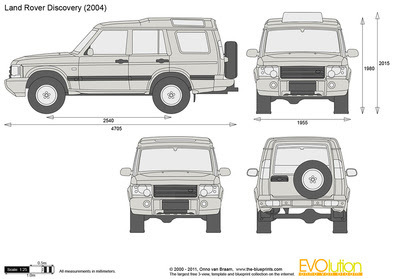 I adjusted a model of a Discovery 1 by lining up with some 2D plans purchased from The-Blueprint.com of a Discovery 2. They are significantly different. The only similar panel is the rear door! The plans were not perfect in that there was no top down view and the various projections did not line up with each other. I had to individually adjust the scale in each direction to get something usable as a background. Good enough for a 1:32 scale model. The model is made of separate parts which can be combined for exporting to STL file. There are also lots of bits not needed for the finished physical model but useful for creating the virtual 3D model. This was my first car body so it was a learning curve. The blend file in the download section was used to create the STL files which in turn are used within the Ultimaker Cura or other slicing software to produce the gcode used to control the printer. 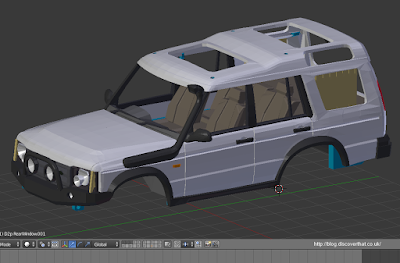 I have learnt a lot during the process and the STL files produced from this model are not very efficient. Even when I printed from them it took 3 or 4 failed attempts before I got a usable body. 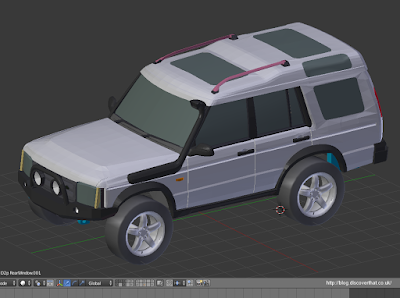 I made some design changes as I produced the model. The most useful tip is to make the surfaces easy to sand smooth. It is better to glue on small details rather than try and include them in the model because they will only get sanded off trying to clean up the surfaces. Tiny 1mm 3D printed pegs will never fit in to the tiny line up holes so design holes in both parts and use brass pins instead. I also ended up exaggerating nearly all details by about 0.15mm. Again, this was to take in to account them being sanded away. - Join all the objects together that are using in each STL file export. I now know that slicing software does not produce very reliable results with overlapping components! 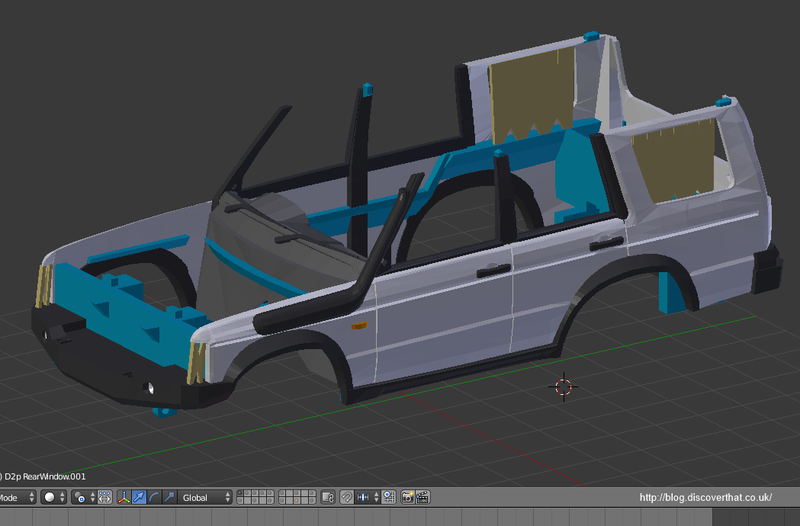 - Make the interior fit from underneath. In this version the parcel shelf is above the rear cross member but the front floor is under the dashboard. This was intended to make fitting a single piece vacuum formed window fit but that didn't work anyway. I fitted individual windows so the interior could have been a better design. 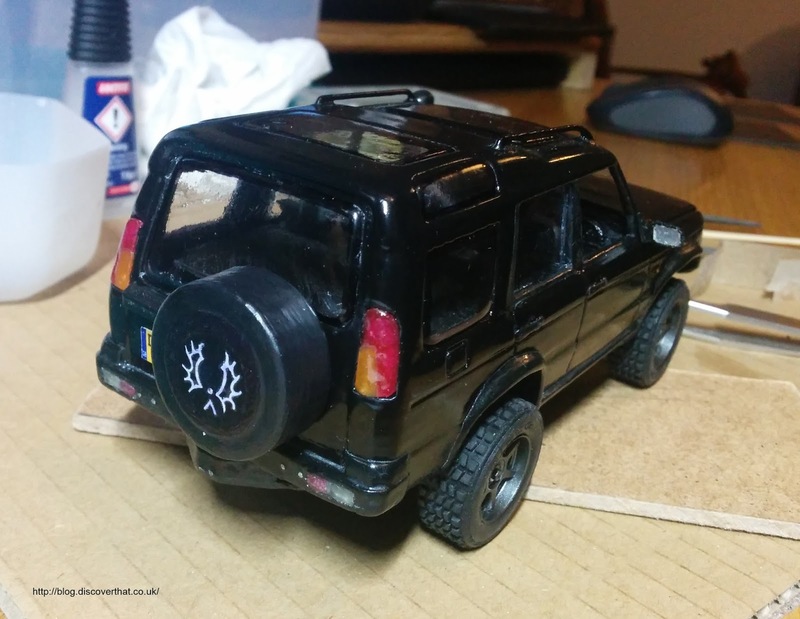 - The very rear of the parcel shelf, after the cross member could be built in to the body of the model. - Fit the windows from the outside. I would add a tiny lip round most window frames. Only the passenger door windows would continue to be fitted from the inside. - Make most of the windows from flat 0.5mm clear PETG. Only front window and alpine lights need to be formed in to curves. I would use 0.75mm PETG if I was vacuum forming the curved windows. 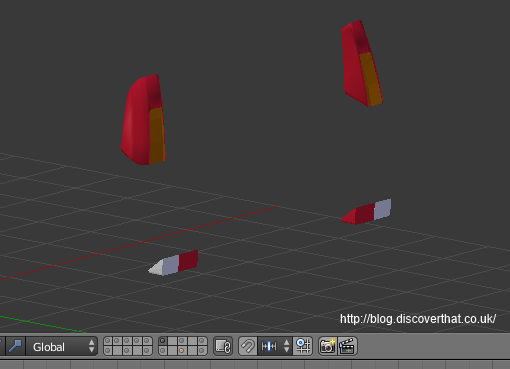 - Split the model at the indented line round the body and glue together after printing. This would reduce the amount of support material required and might make the upper part of the body more reliable to print. The bonnet could also be included as a piece of the body. - Try splitting the car between the passenger doors and print each half vertically. More of the model could be printed as one piece. It was fun but don't expect an easy or quick job if you try it yourself.